We Know Where You Can Find Nutella Gyoza On The Gold Coast! Do we have your attention? We thought so! Harajuku Gyoza has just swung open its doors, and their Nutella freakin’ gyoza and infamous raindrop cake are two of many reasons you should be getting your toosh along to Broadbeach, stat. Built on the traditions of an izakaya (a bustling, old-school Japanese bar), it’s the infectious vibe and typically kitsch atmosphere and décor that’s really going to make Harajukua Gyoza a hit among locals. At Gold Coast’s newest Asian eatery, the all-Japanese wait staff are beaming with smiles and full of enthusiasm. We seriously wanna pinch their cheeks they’re so cute. Everyone is welcomed with a loud chorus of “Irasshaimase!” and we dare you to order a round of sake to start, and watch things get really wild. Watch on as upwards of 10 staffers madly work away in the compact kitchen, with steam wafting from Japanese-imported gyoza grills, and adorable worker bees positioned in the front window painstakingly hand-making gyoza and dumplings. They tell us a staggering 10,000-plus gyoza will be hand-rolled on a busy weekend—our fingers are aching just thinking about it. It appears to be organised chaos in the kitchen, but somehow it just works! While you can sprawl outside on a high-top table lining the front patio and overlooking Victoria Avenue, we suggest you step in through the arch doorways and find a booth in the dimly-lit rear dining area. Where Japanese plates painted with scenes from Tokyo line the wall and red lanterns glow above each table. Harajuku Gyoza is already an institution where it originated in Bris-vegas, with four izakayas across the city and one in Sydney. The shiny new Broadbeach venue is their largest to date, meaning a bigger menu selection and the addition of breakfast. Um, ramen noodles, bao eggs benedict, and wobbly soufflé pancakes for brekkie? We’re so there! On the menu front, there’s a ridic line up of tasty morsels on offer. All well priced, so you can take a few friends and order one of everything. Of course, there’s more gyoza options than we thought humanly possible; think: pork, lemongrass chicken, duck, three cheese, and veggie, plus dessert versions with Nutella, salted caramel, peanut butter and white chocolate… WTAF. We’ve died and gone to gyoza heaven! Harajuku has mastered the open gyoza too, with pork belly, smoked salmon, tofu, and the added crunch of fresh adornments like edamame, apple, pea shoots, and celery served inside a crispy gyoza shell, like a perfect Japanese taco. Leave valuable stomach real estate for Takoyaki octopus balls, barramundi Kushikatsu, fragrant salads, chicken katsu don, ramen, karaage, and salmon sashimi poke bowls. And that’s only a fraction of the goodness on offer. You might recall we broke news a few weeks back that Australia’s first ever Japanese micro brewery was opening on the Gold Coast? Well, these are the guys who’ve brought this epic facility to our sunny shores. So legit, they’ve even mastered the craft of Japanese brewing styles with assistance from the century-old Kizakura Brewery in Kyoto, Japan. Grandly titled the Harajuku Gyoza Beer Stadium, while the brewery facility is not operational just yet (they were busting their butts to get the doors open in time for Blues On Broadbeach), the bar is fully operational and the four shiny 1,200-litre tanks behind will soon be bubbling away with Harajuku’s in-house Japanese craft beer brand, Yoyogi. Order your frosty Yoyogi by the mug or growler or, better yet, gather a group of 10 or more friends for your next shindig then order a 10-litre mini keg of Yoyogi which attaches to the tabletop and allows you to pour your own beer. How fun is that? Among some local faves like Balter and Black Hops, there’s a tonne of other imported brews including Kirin, Asahi Black, Orion, and an Hitachino Espresso Stout, plus Japanese-inspired cocktails, Japanese whisky, and sake served with all the fanfare (go on, order a nip or three and see what happens). Best be practicing your best “Kanpai!”—that’s cheers, you guys. 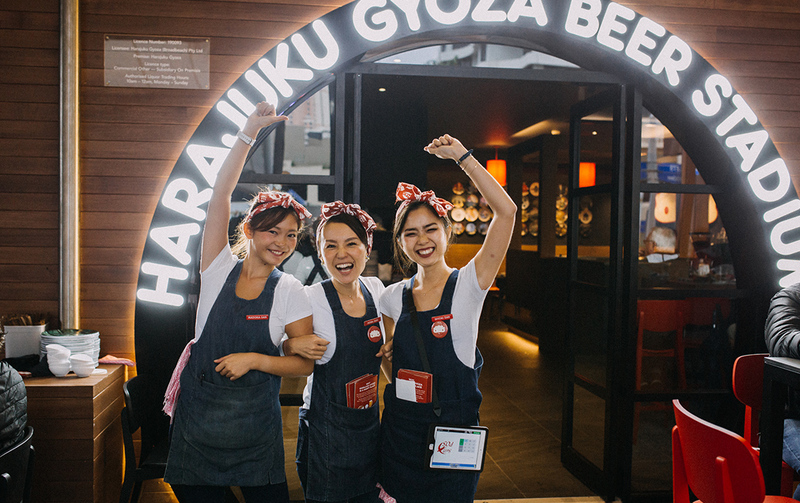 We’re calling it now; Harajuku Gyoza is a ball of energy and is going to bring a whole injection of life and laughter to this brand new foodie hub in Broadbeach. Pull on your stretchy pants and go eat your weight in gyoza and dumplings, we’ll be right there alongside you.